Well, well. The good ship “Alt-Right” was caught on the high seas, and its degenerate crew was caught on board with their draws down,intent on defending a patch of earth called Europe, from other members of the human family. This pack of sewer rats, “Defend Europe”, highlights a form of madness brought on by racialist/nationalist sentiments, and serves to highlight once again the total abandonment of religious principles by these pathetic creatures called “The Alt-Right”. Instead of aspiring to lofty behavior, the Alt-Right would rather be debased and sink to the lowest abyss. So spiritually depraved is this band of racists that their hollowed out brains could only come up with the lame excuse that the goods in their possession which describe their nefarious intentions was “Fake News”. This tiresome and hackneyed phrase has worn out its welcome and is used by lunatics obsessed with being satanic in nature. Just a bunch of cartoonish creatures, infatuated with their skin color, and having been descended from “Africans” who migrated into a land mass now called “Europe”, some 40,000 years ago. And this screed is an example of why God Emperor Trump won the election. Praise be to Kek. Trump is no God, he’s a wannabe emperor who plays the part quite well, and he won with a lot of help of ignorant Americans who no longer know how to think objectively. Winning an election, with a lot of outside help, while increasing the level of hate and vitriolic rhetoric isn’t a victory. It’s a clear sign of the distortion of human nature, and America is very distorted indeed. Are you in that category as well? By the way, I’m unfamiliar with your pagan god called “Kek”. And one other thing, Wayne—Take a shower, learn some manners, find yourself some female companionship, educate yourself, and get an enema—take the shower after the enema, please. Typical, the only hate is the hate you exhibit. Oh, and I shower regularly (unlike dirty hippies), I’m married to a loving wife, I’m quite educated (I just don’t subscribe to the hate filled “education” of the lowly leftist), and is that your particular kink? May the power of Pepe and the glorious autism of the meme magician enlighten you. Praise be to Kek. That all came from you and yours. Wow, you didn’t make a single actual point, just a whole four paragraphs of invective for fake internet points. The C-Star did nothing wrong, that’s why they were released, the NGO’s falsely reported them. And yet when thousands of young men pour into other continents, it’s called ‘colonisation; ‘invasion’ and ‘crusade’. 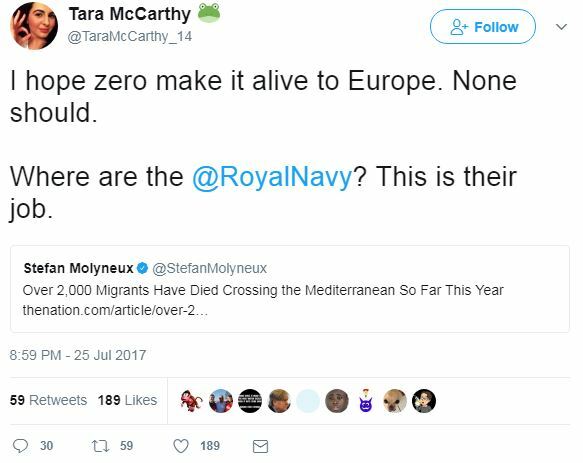 You know people smuggling on the scale that’s happening in Europe is immoral and dangerous, but you love to be a smug liberal more than you love to help the people, on both sides of the sea there, that really need it. Neither of these things are true, which is why the ship was released. They aren’t hampering rescue efforts OR humanitarian work, they are highlighting the ACTUAL people smuggling trade.